Parx Racing offers the $1-million Cotillion and the $1.25-million Pennsylvania Derby on Saturday. A win would go far in deciding who the champion 3-year-olds are this season. 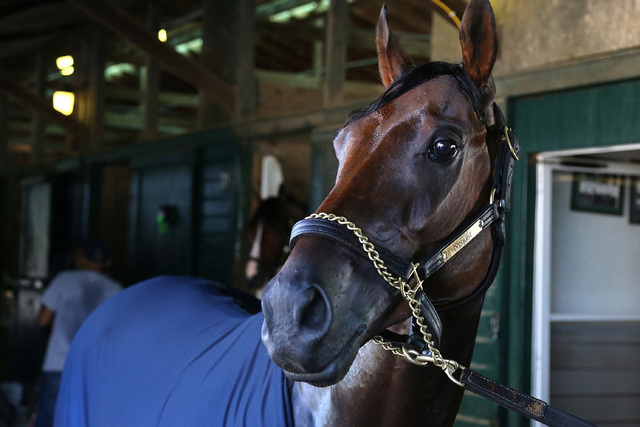 All eyes on Saturday will be on Parx Racing in Bensalem, Pennsylvania. The $1-million Cotillion and the $1.25-million Pennsylvania Derby will attract the top 3-year-olds of both sexes. The Derby will help, but not decide, who the leading 3-year-old male is this season. The only colt missing is Arrogate who won the Travers by 13 lengths in Saratoga track record time. Kentucky Derby winner Nyquist (5-2) and Preakness winner Exaggerator (9-2) are the headliners but this is not a two-horse race. West Virginia Derby winner Cupid (5-1) and the locally owned Gun Runner (6-1) rate solid chances to upset. Gun Runner is owned by the Winchell Thoroughbreds of Las Vegas. Nyquist won the first eight races of his career but has lost his last two starts in the Haskell and Preakness. He is ridden like a speed horse by Mario Gutierrez. In reality, and I wrote this before the Haskell, he is a horse with a high cruising speed who does not need the lead to win. They should let Nyquist settle a few lengths off the pace and only when they reach the quarter pole should he be asked for his best. Exaggerator is a proven wet track maestro who clearly is a step or two slower on a fast, dry track. There is little to no chance of rain on Saturday. He really needs to run a big race to dispel that notion. One horse, Hit It Once More (20-1), has a big chance to outrun his odds. He has really developed for trainer Gary Sciacca in winning two restricted New York bred stakes, the Albany and New York Derby. The Cotillion on paper looks like a stroll in the park for the undefeated Songbird (1-2). However, a caveat is whenever a horse travels and runs over a quirky main track like Parx, strange things can happen. Cathryn Sophia (5-2) is a top class filly who is also a horse for the course. Parx is her home base and she has won both of her starts there. Songbird will be a single on most multi-race wagers on the Parx card. I suggest using Cathryn Sophia in saver wagers because if she wins, it will open the door to some very nice prices. You may have noticed a new football pari-mutuel bet in Las Vegas offered by USFantasy Sports. The Review-Journal has covered the bets’ development this year. In brief, it made fantasy sports betting on the NFL pari-mutuel. The reason I mention it in a horse racing column is this product may fit through a loophole in states where pari-mutuel and/or daily fantasy sports betting are already legal. USFantasy is simple to play and racetracks could market a legal sports bet to attract new customers. When the Meadowlands meet begins on Sept. 28, there will be two unique features. All races will be run on turf and an industry low 15 percent takeout will be offered on all bets. Canterbury Park offered the same low 15 percent takeout this season too. The issue for track management is to make up for the loss of income the overall betting has to increase double digits. That is asking a lot in today’s business climate.